In trigonometry an angle is usually drawn in what is called the "standard position" as shown below. In this position, the vertex of the angle (B) is on the origin of the x and y axis. One side of the angle is always fixed along the positive x-axis - that is, going to the right along the axis in the 3 o'clock direction (line BC). This is called the initial side of the angle. 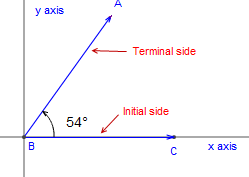 The other side of the angle is called the terminal side.